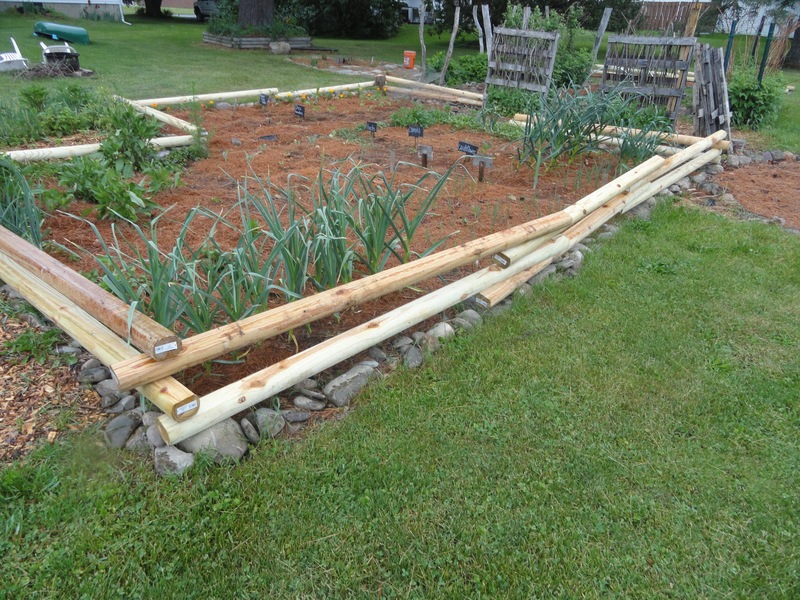 How does growing garlic get out of hand? 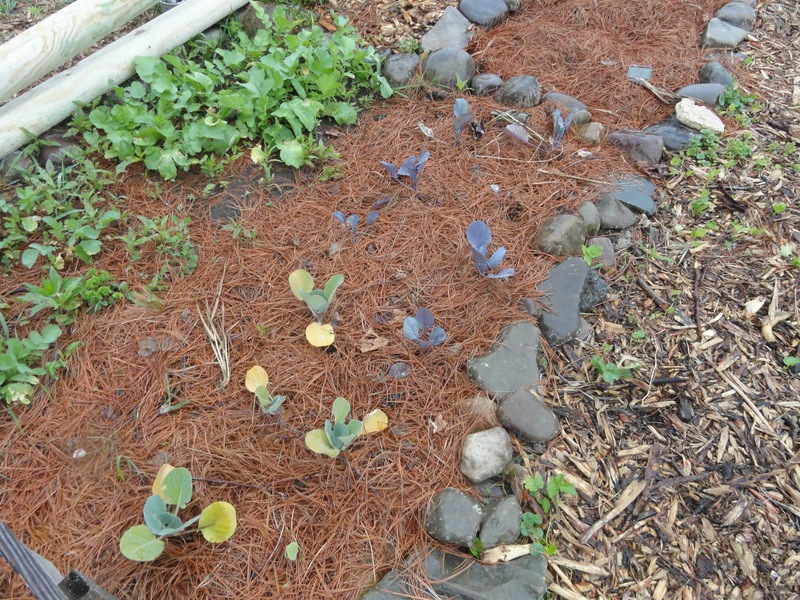 Most of this patch is German Extra Hardy, a common variety that stores well and is delicious. Last year, I saved more than I need. If you would like some they will be for sale in the next month. The other four varieties are Broadleaf Czech, Chesnok Red, Pink Music, and Hanging Dog. I am growing Chesnok Red, Pink Music, and Hanging Dog for the first time. It is always exciting to see how the plants look in the spring. I had not seen them before this spring. They are all heirloom varieties. In a few years I will have enough of a harvest to supply my growing and eating needs. I am most excited to dig up and eat Hanging Dog, from what I understand it is an elephant style variety. So I am looking forward to seeing what a full head looks like. The garlic flowers are also developing. The scape is the flower of the garlic plant. I cut them so the plants put more energy into the bulbs. There are some who disagree with this process, but it works for me. 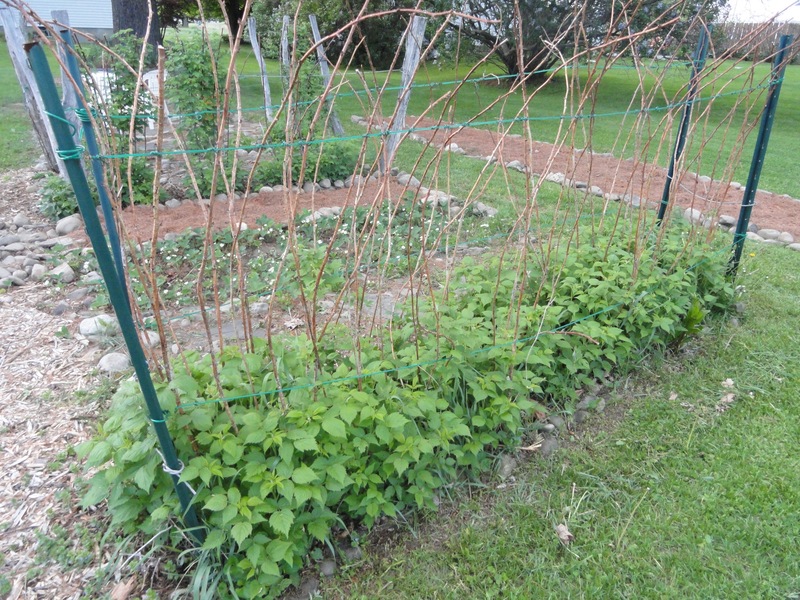 The spring weather has been beneficial for the raspberries and other early fruits. The yellow raspberries are coming along nicely too. It is nice to go outside early mornings and pick fresh raspberries. Fresh lettuce this time of year is great too. 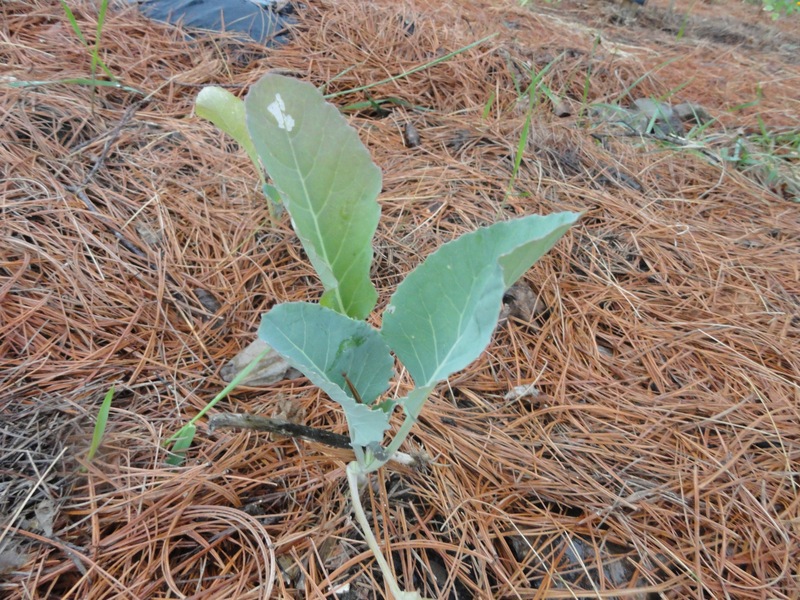 Tennis Ball lettuce is a very nice head lettuce. The Monticello gardens grow tennis ball lettuce. Apparently, President Thomas Jefferson liked how easy and low maintainence this lettuce is. It is also tastey. This looks like a busy week, with lots of projects to get down. Fortunately, we are eating well. 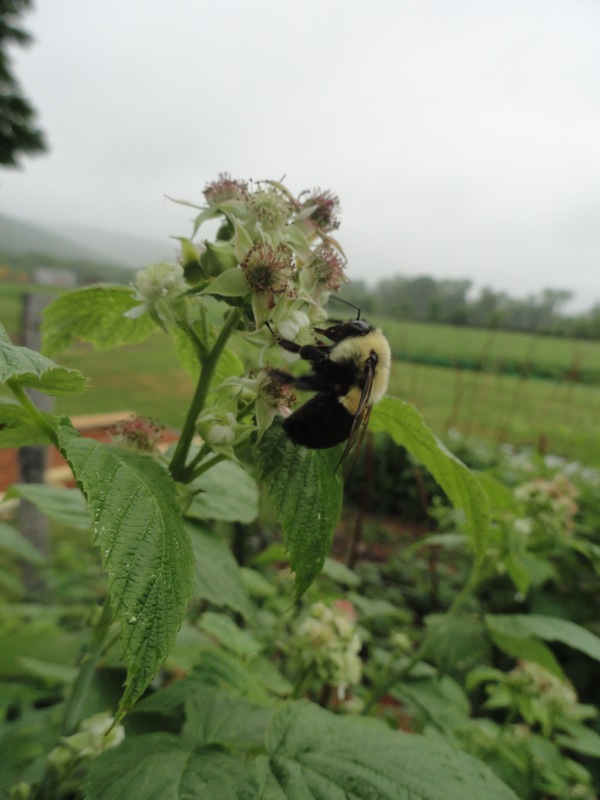 Spring has been busy this year at Cohocton River Rock Micro Farm. I was reflecting about how different two years can be. Last year, on Memorial Day, I gave a farmer friend all of my black raspberries. 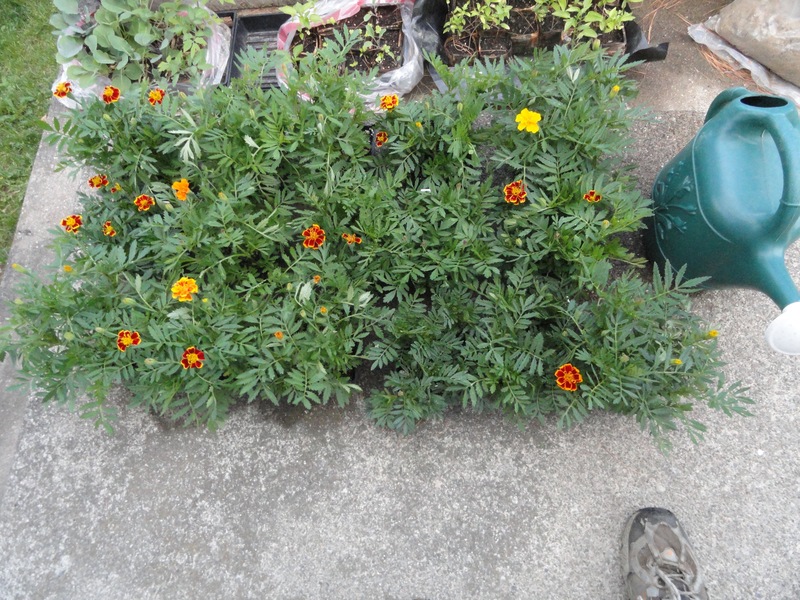 I had planted them too tightly and they never were able to reach their potential. When the farmer came, the soil was dry almost a foot down. What we all feared, eventually played out, was a long drought. In contrast, this year we have more water than we can deal with. Tractor farmers are struggling to their seed in ground, and get their hay in at the same time. However, I will take more water over not enough. Nature, and I, abhors a vacuum. Two empty rows, where the black raspberries were needed to be filled. I wanted to keep those rows in fruit production. So I started to dream. Dwarf or small varieties moved to the top of the list. My family really enjoys cranberry. I thought we could save a few bucks if we grew some of our own cranberries. So I chose “Phillips” Cranberry from Fedco Seeds. It is a “highbush” cranberry. Not a true cranberry but looks and tastes like a cranberry. I am told it will grow about eight to 12 feet tall. 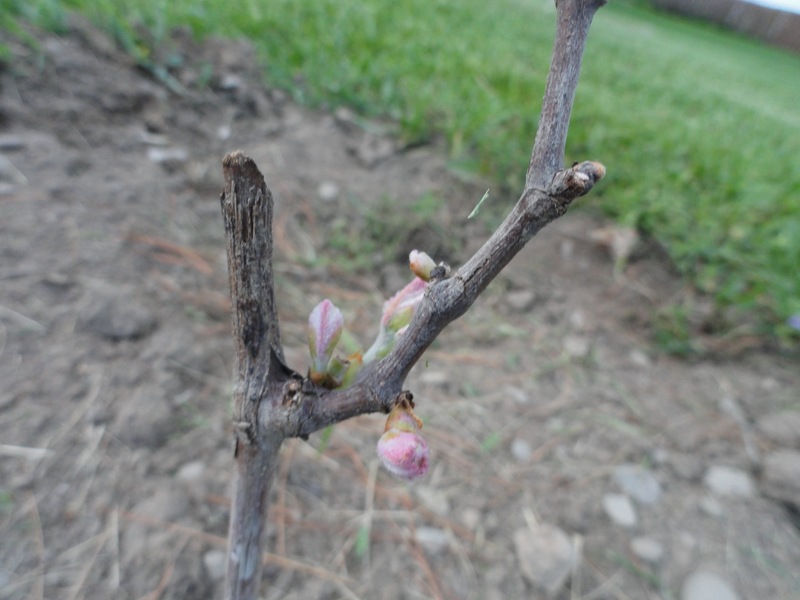 Regular pruning will help it fit well into the space, and allow me to harvest all the fruits. I also added a dwarf mulberry tree called “Girardi”. A tip from a farmer friend suggested this variety from Whitman Farms. My farmer friend says mulberries make the best jelly. I figured it will be the right size, six feet, and it is a fruit. Also, it is a rarity so I have a good story to tell. I am excited to taste these fruits. The young tree has a few fruits growing, and I will get them before the birds do. My neighbor Ted and I were talking this week. He was walking me around his growing totes and garden areas. 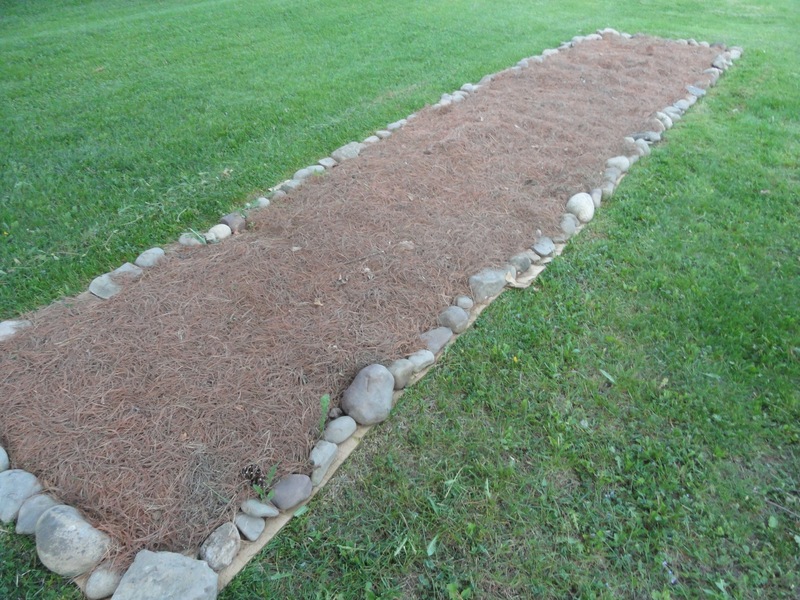 He needed to clean up a bed, and mentioned he had horseradish wandering into an area that will be planted in squash in a few days. He offered and all the horseradish root I wanted. That was an offer I could not pass up. I dug up the rogue horseradish(es?). 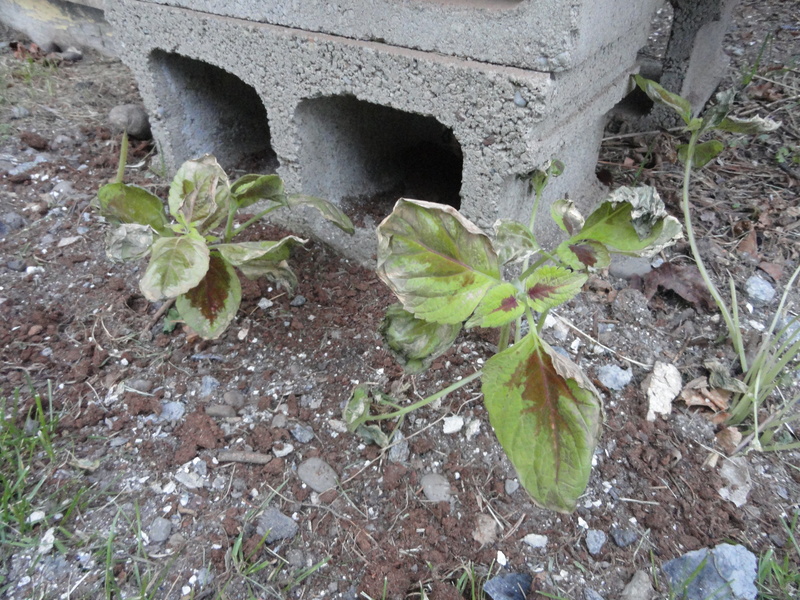 I transplanted them in a small area, and hoped they would survive the transplant. I was worried for the first few days. They did not look like they would make it. Recently, it looks like they are enjoying their new home. If the weather does not heat up to fast they will be in good shape. Neighbor Ted told me a few days later he was given the horseradish by a friend from Prattsburg, NY. He said his friend insisted he take the roots. He took them, planted them, and then never did anything else. Hopefully, I can find a friend or two that would like fresh horseradish next year. Three out of the last four years I have attended at apple tree grafting class. The Cooperative Extension in the next county over offers this fantastic class. Two years ago I thought I had been successful. The drought and my poor skills were a deadly combination. With renewed vigor and more experience I think this year will be different. 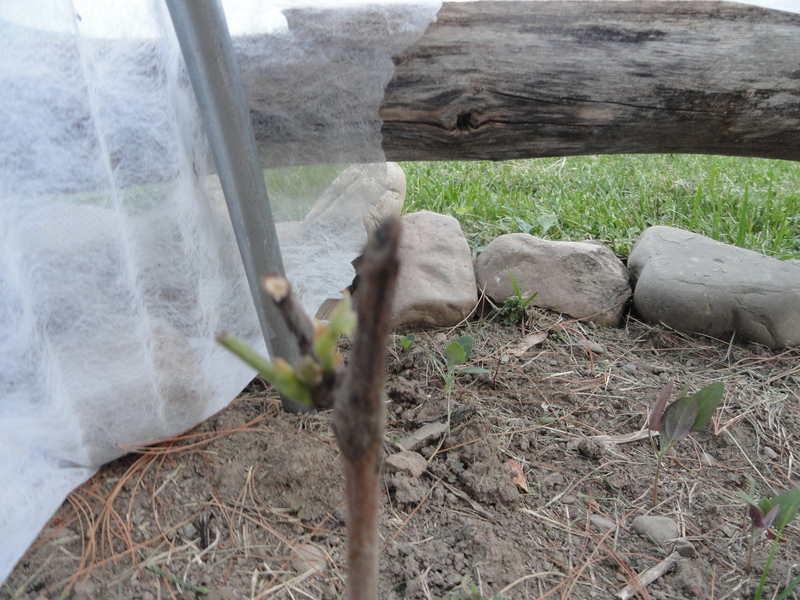 I think I have successfully grafted two heirloom apple trees. I will keep them in the buckets for this year. Keeping them on the back porch should remind me to water them more often, and if they are getting too much direct sun I can move them to some shade. 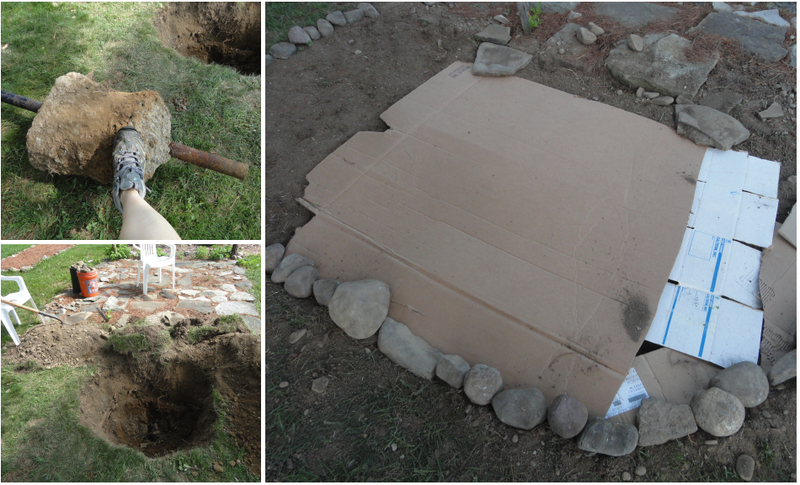 If they do not survive I also do not have to dig a hole. 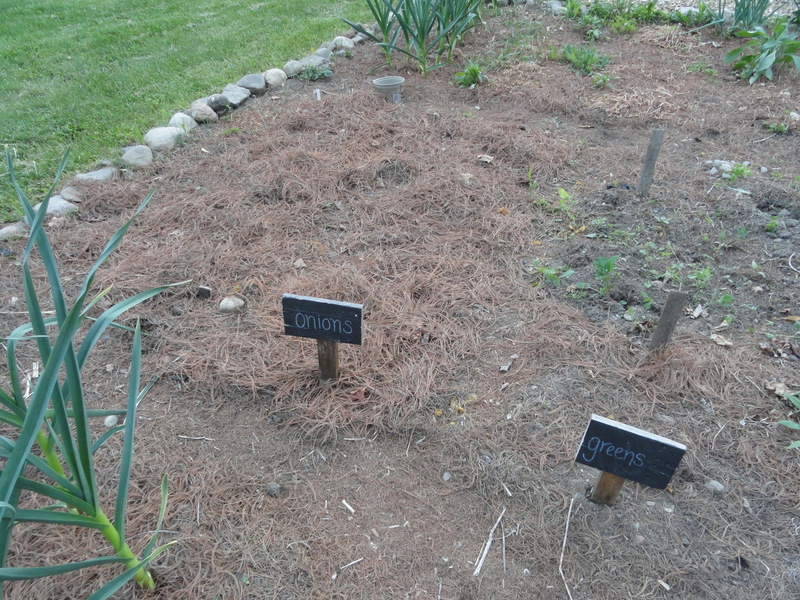 They will go into the ground next spring while they are still dormant. The Newtown Pippin was originally found on Long Island, and was grown by George Washington and Thomas Jefferson. Keepsake variety is that is known as a “keeper” apple. The instructor of the class said do not eat this apple until January. It only gets better the longer you wait. He said it “keeps” until late spring with little trouble. One of Keepsakes parents is Northern Spy so I am confident it is a good baking apple. Keepsake is one of the parents of the very popular Honeycrisp. I am excited to see what these trees provide. I am learning the best tasting apples may not be the best looking apples. There are many, many, many, varieties of apples. We do not get to see most of them at the store. I encourage you to search out a new variety of apple. Look with your taste buds, not your eyes. You may really be surprised. A strange winter continues here in upstate New York. Mostly it has been mild. We have not recieved much snow. The temperatures last week were unseasonably warm. 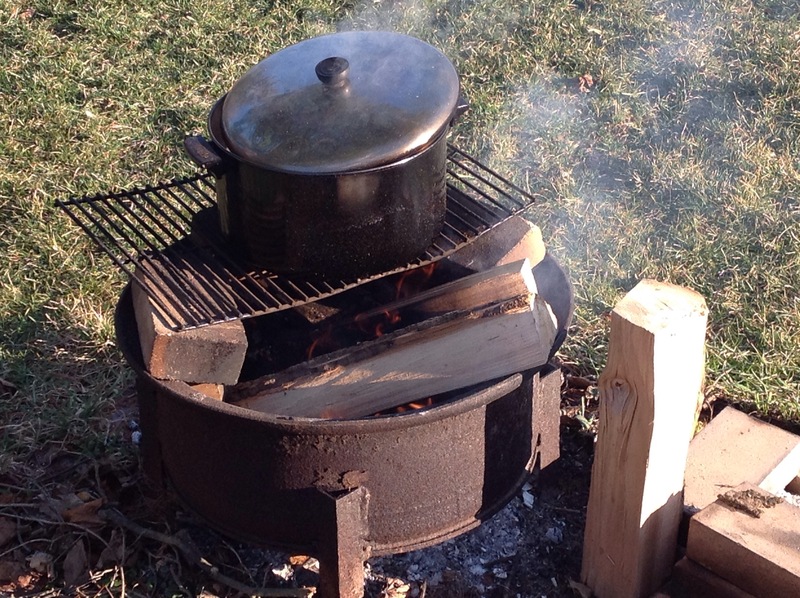 Regardless, it is late February and that means the maple sap is running. How well it is running is the topic of conversation. The truth is we will not know for another week or two how the season went. Today, I get to boil, and boil, and boil. 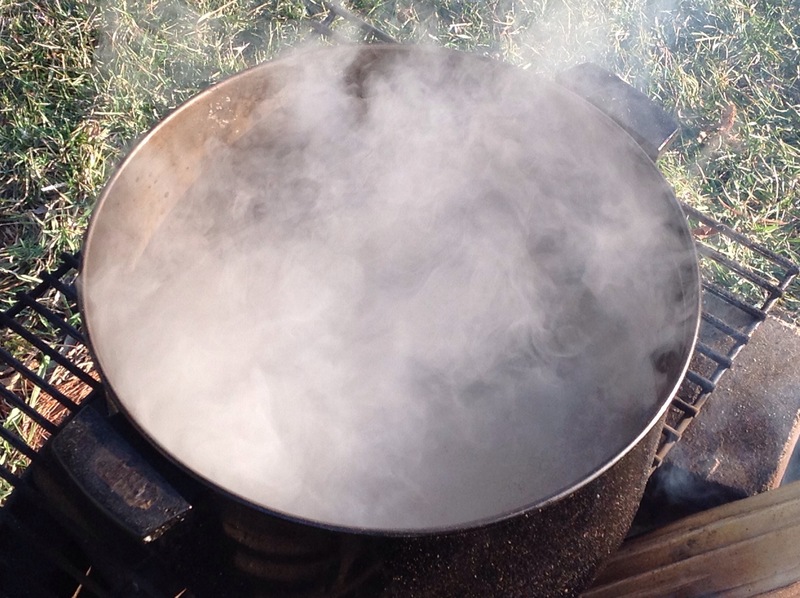 The next timeyou have maple syrup on your pancakes remember some boil 40 gallons of sap for one gallon of syrup. Usually, at this point in the process I wonder why I do this. Mostly, because I like it. There s deep joy in making something for yourself. Maybe it tastes sweeter. My little operartion begins with three maple trees. They are old, wonderful producers. 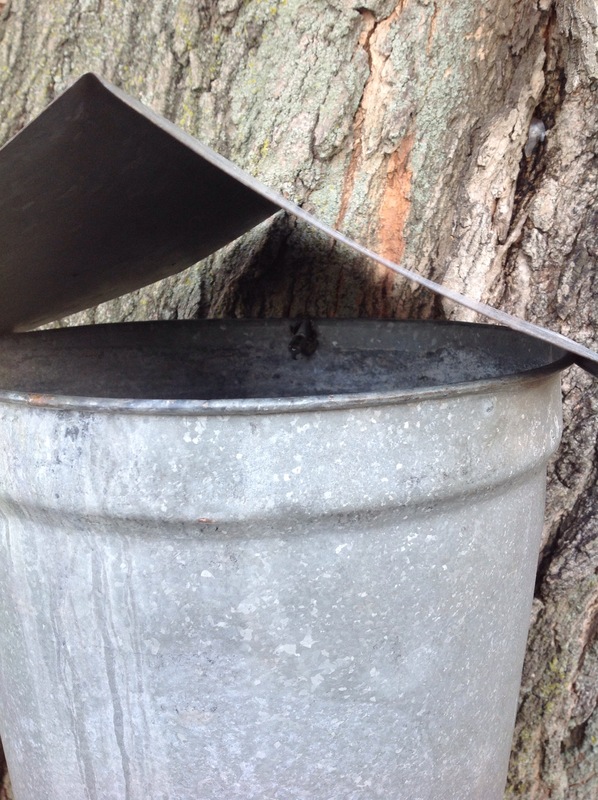 ﻿ I collect the sap daily, and boil when I can. 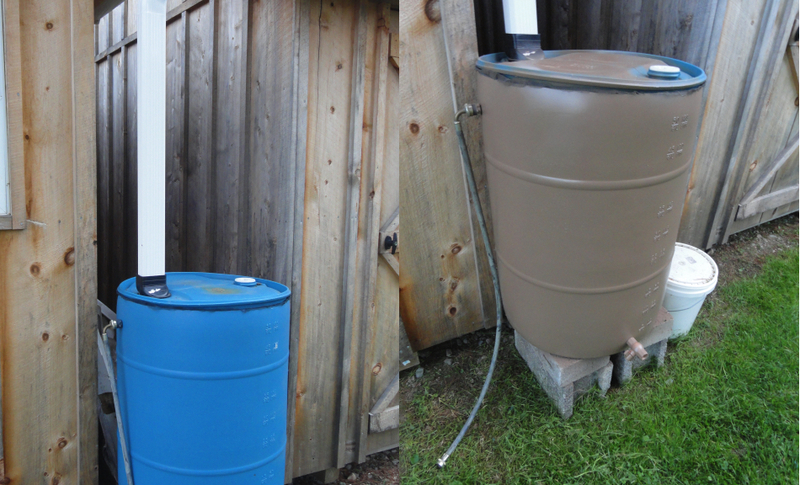 Last week I was getting about ten gallons a day. I can not keep up with the much production. Sadly, some of the sap spoiled. I think I have found a boiling set up that will allow me boil more than before. With some adjusts of our fire ring I seem to have found space to create enough heat to boil and to maintain that temperature for longer periods of time. Time to add another log to the fire. Unexpected Productivity or Who Knew? Earlier this afternoon I started to wonder what had happened around the Micro Farm this past week. The events of the week that first came to mind were good things, and productive, just not around the Micro Farm. 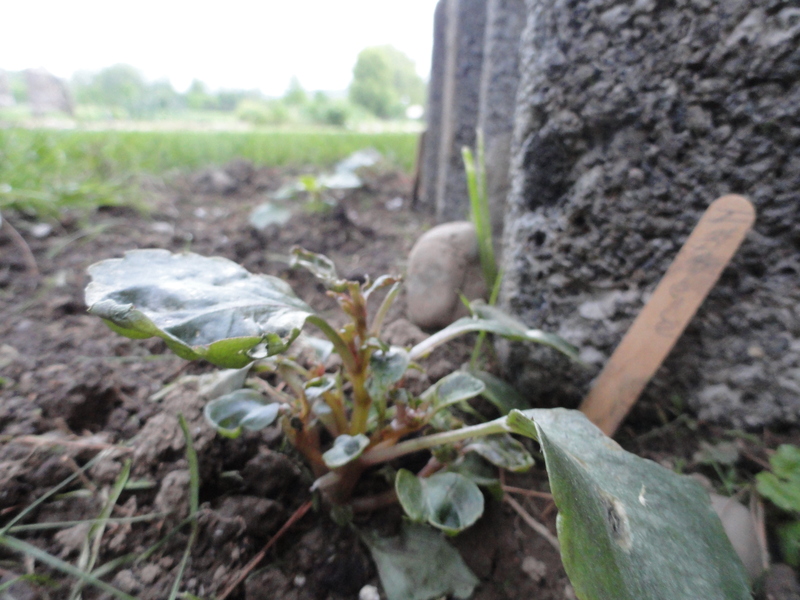 Then I went out to take pictures to document the plant growth of the past week. The pictures tell the bigger story. 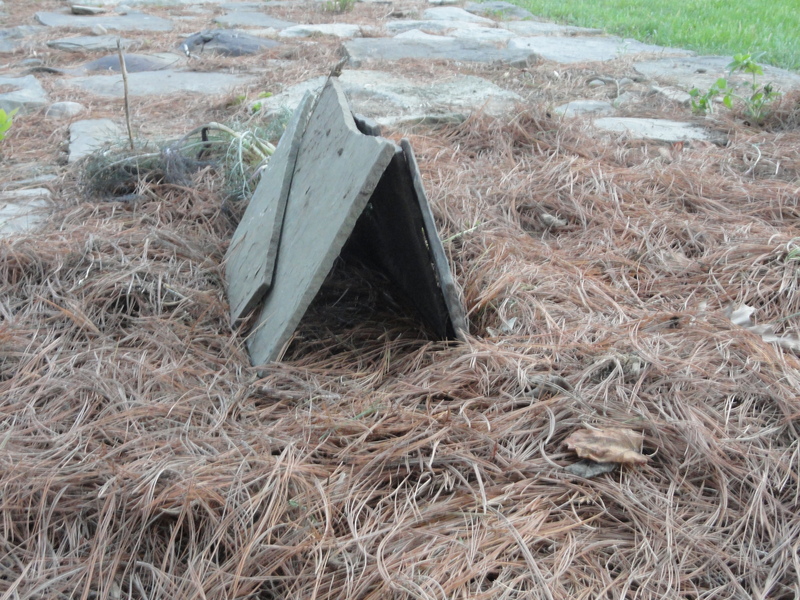 After a light rain in the middle of the past week I realized I needed to re-configure the angle of the gutters. After thunderstorms today the gutters are working better. The rhubarb is coming along well. 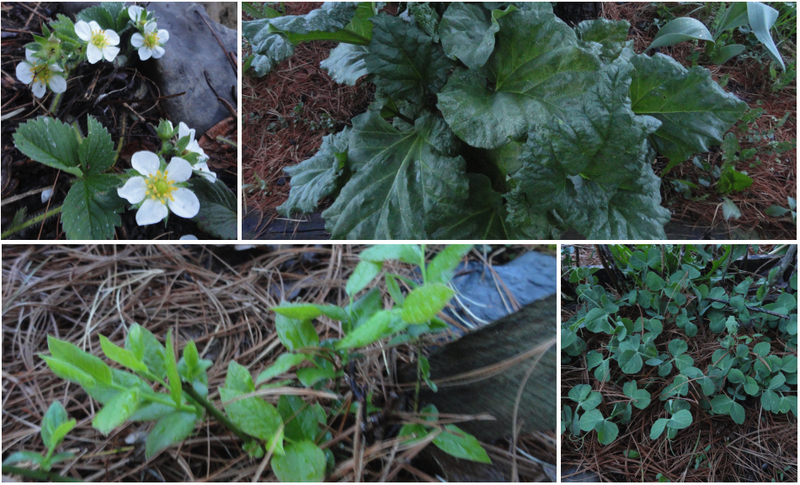 It has been a very dry spring for us, and I was concerned it would slow down the rhubarb. I am please to see it doing well. I have a rough history with this blueberry bush. It has been there for about three years. It has watch me kill its three other compatriots. Now it is full of green growth. I am very happy to see it doing so well. 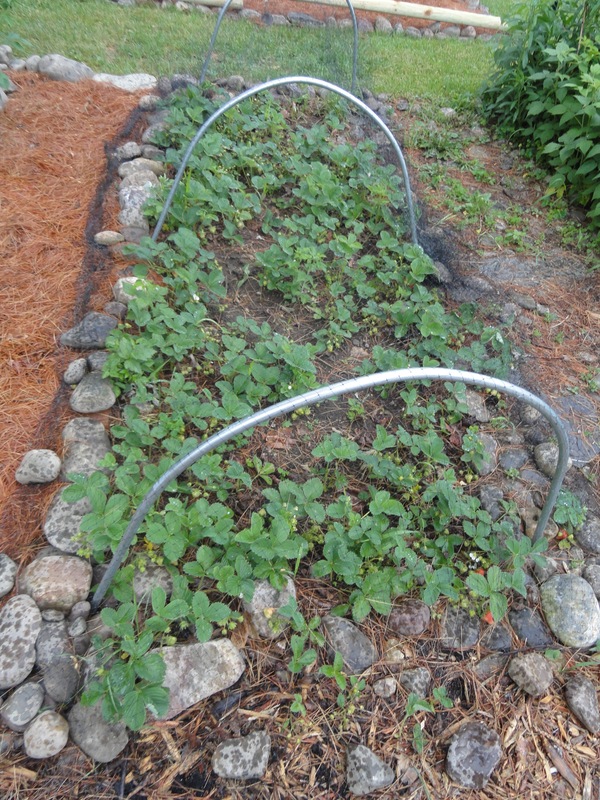 I am looking forward to strawberries, basically for strawberry-rhubarb pie. Hmm. Now I am hungry. 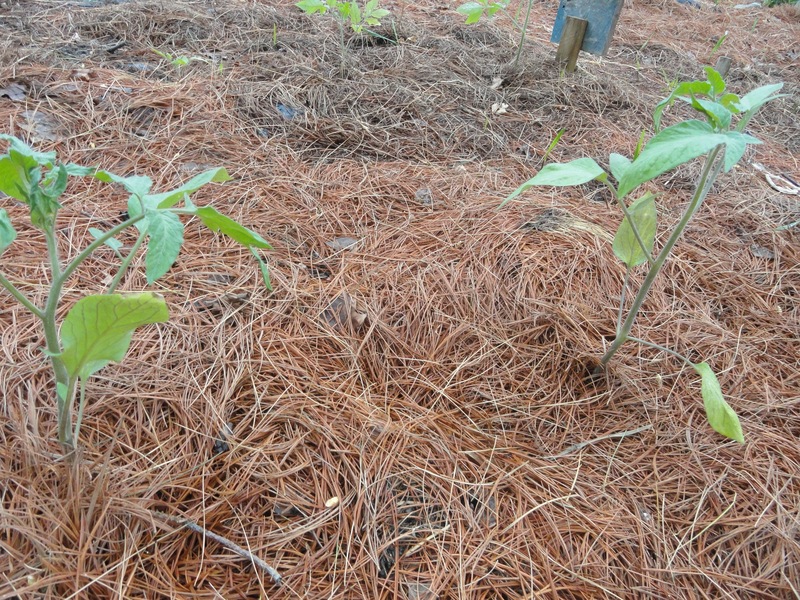 The peas are pushing their way through the pine needle mulch. They are looking very strong. Although, it has been unusually hot here for about a week it is expected to cool down. This is good news because peas get tough in the heat. 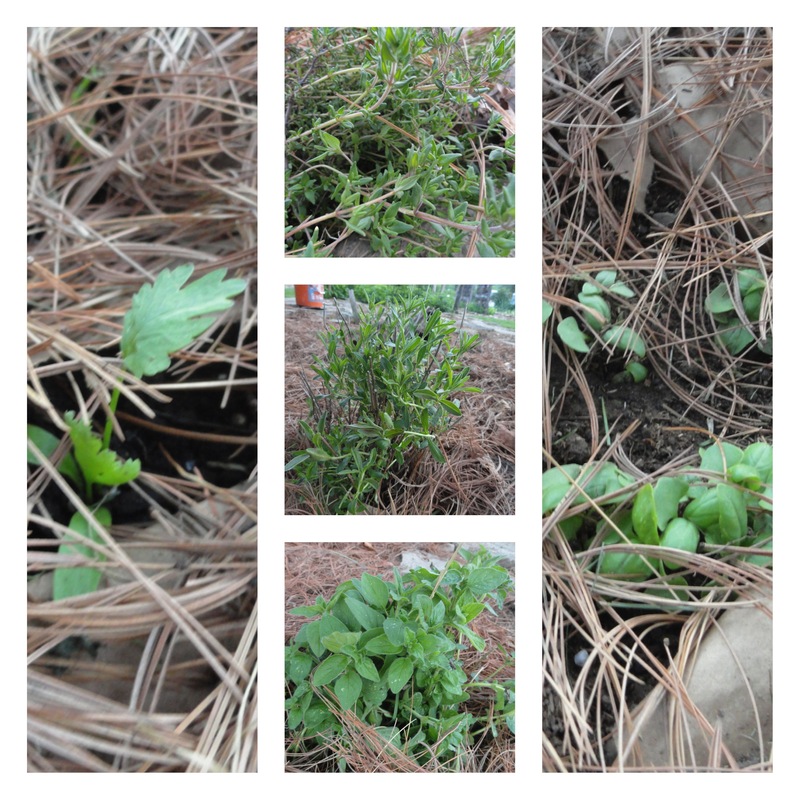 I have grand plans to re-located my herb bed this spring. 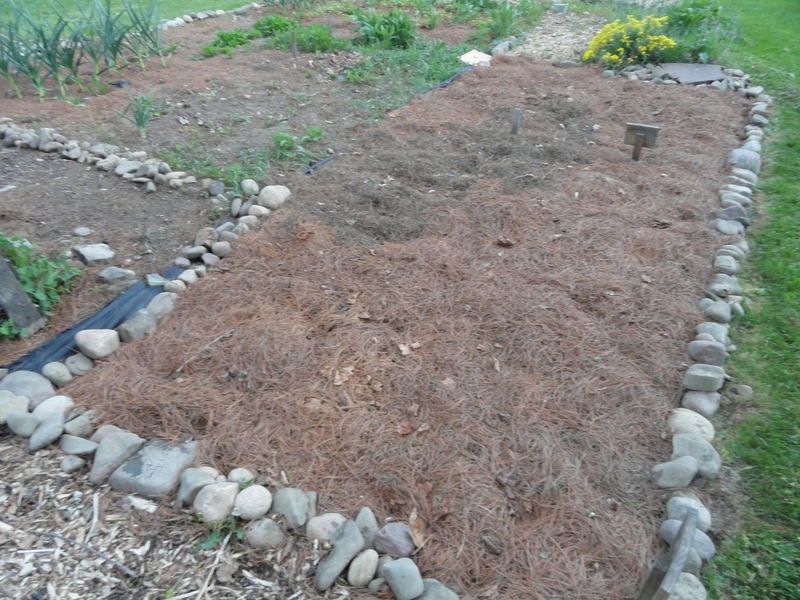 I have a spot that gets a little more shade that I think would be more conducive to herbs. It would also let me get away from a wildly aggressive mint plant. 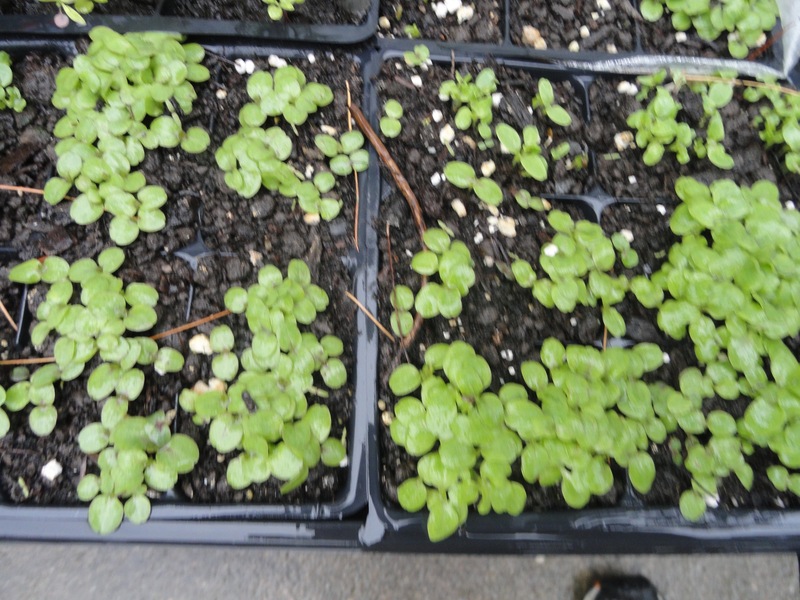 So I started a bunch of basil and cilantro. I also use flowers to help with insect control. 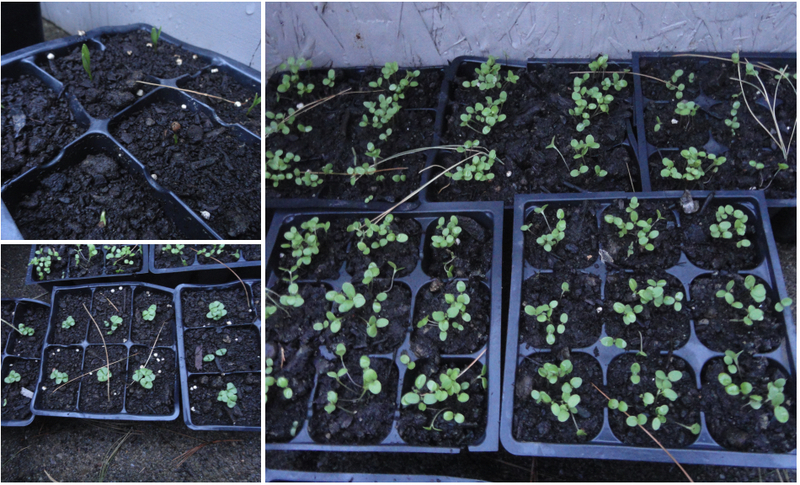 I like alyssum, or carpet of snow, so I started several six packs recently. It will not be long before they are placed in the gardens. So while I was thinking not much happened, I am thrilled to be wrong. There is much more to do this week. It would be nice to get more done than I think for two weeks in a row, but that might be expecting too much.